The 3-year long DeFishGear was an IPA-Adriatic funded project aiming to facilitate the efforts of policy makers and stakeholders in effectively dealing with the issue of marine litter in the Adriatic MacroRegion, towards litter free coasts and sea. The DeFishGear activities were implemented by a multi-disciplinary team comprising academia, research institutes, national and local authorities and NGOs from all seven countries of the Adriatic Sea, reinforcing and strengthening cooperation and fostering joint and harmonized actions towards a litter-free Adriatic. MIO-ECSDE led the Work Package on Monitoring and Assessment of Marine Litter in the Adriatic and Ionian Seas. 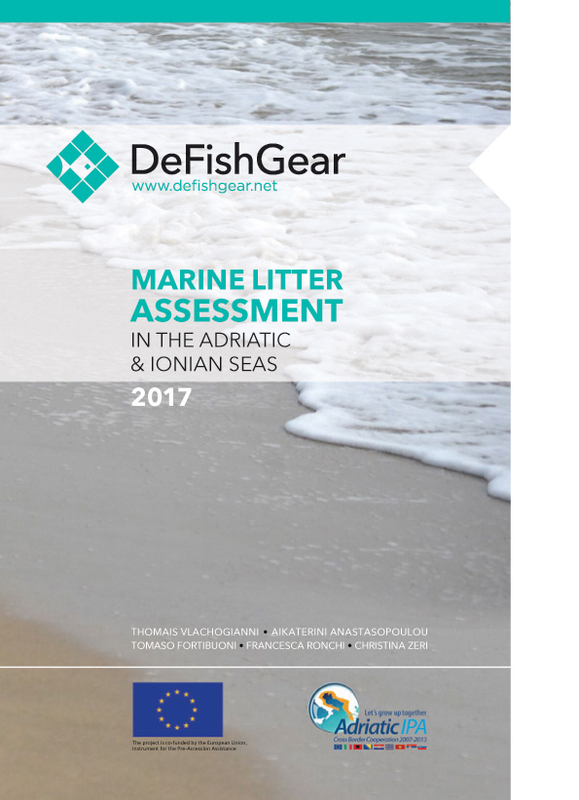 The DeFishGear project aims to facilitate the efforts of policy makers and stakeholders in effectively dealing with the issue of marine litter in the Adriatic MacroRegion, towards litter free coasts and sea. Ultimately, the DeFishGear project will provide a strategic input to regional efforts in successfully achieving good environmental status in the Mediterranean Sea. Development of recommendations and policy options based on sound-scientific evidence and knowldge to meet regional and national objectives regarding marine litter (Marine Strategy Framework Directive, Regional Action Plan on Marine Litter Management in the Mediteranean, Ecosystem Approach, etc.). Setting up of a system to collect and recycle derelict fishing gear and implemenatation of ‘fishing for litter’ activities, in an environment-friendly way;Awareness raising of different target groups (fishermen, policy makers, educational community, etc.) on the impacts of marine litter and the types of action they should undertake to effectively address this issue. A purpose-built database developed within the scope of the project and publicly accessible at http://defishgear.izvrs.si/defishgearpublic. The DeFishGear database uses the “ArcGIS Server” software for spatial manipulation and the “Nukleus GIS” software for viewing environmental information and it is hosted by the Institute of Water of Slovenia. Proper monitoring of our coasts and seas is an important contribution to keeping them litter-free. Therefore, MIO-ECSDE produced a video tutorial on how to monitor marine litter on beaches. A self-paced distance learning module on how to monitor marine litter on beaches, the sea surface and the seafloor was designed to be comprehensive enough yet not time demanding so that any interested busy practitioner, administrator, professional, student or NGO staff member can enhance her/his skills on how to design and implement marine litter monitoring activities. It provides the necessary technical and scientific background to support the design and implementation of marine litter monitoring programmes within the framework of the EU Marine Strategy Framework Directive and the UNEP/MAP Regional Plan for Marine litter Management in the Mediterranean. The methodologies showcased have been pilot tested by the DeFishGear project and have been developed based on the ‘Guidance Document on Monitoring of Marine Litter in European Seas’ elaborated by the EU MSFD Technical Sub-Group on Marine Litter and the UNEP/MAP MEDPOL draft Monitoring Guidance Document on Ecological Objective 10: Marine Litter. Theme: Improving marine, coastal and delta rivers environment by joint management in the Adriatic area.